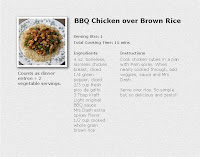 WELCOME TO MY MONEY MISSION ONLINE: SUPER FRIDAY SUPPER RECIPES AND MORE! SUPER FRIDAY SUPPER RECIPES AND MORE! Good Morning everyone!! Remember my post, on Monday, about have a S.O.S. moment regarding supper-time meal preparation?? I received a great tip from lola at lolas diner about All Recipes and I am really loving it! You just type in the ingredients that you DO have, and it brings up suggestions!! Thank you LOLA! 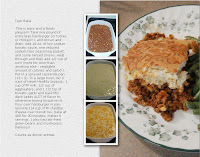 Then, Jeannie over at Jeannie's Happy World sent me, by e-mail, some recipes from her cookbook. I especially loved two of them, and after major raves from my family, I e-mailed her and asked her for permission to post them on my blog. So, here are the recipes, and I hope you enjoy them as much as I did! That's a really cool tip from Lola. I'm going to try it sometime. I feel like I make the same things over and over, maybe I could find something new with what I already have! Hope you have a great weekend. We have tons of chores this weekend but I hope we will get some family time in between all the little things. And thank you for the recipes. I'm gearing up for winter mode and need some new ideas. Hi A.Marie, will sure check out the recipes... Have a great weekend..
By the way, since your blog is all about your money mission online, would you be interested in making money through writing reviews? You can check out my latest post at my Etcetera blog. Please let me know. Hi again. Just came to tell you about the money making opportunity through blog. I highly receommend PayPerPost or PPP they do pay and they are legit. I am sure, you'll be qualified at PPP because your blog has PR already. Paying Post is a different company, I got paid from them already but the last transactions that I got are still unpaid so I wont receommend it.